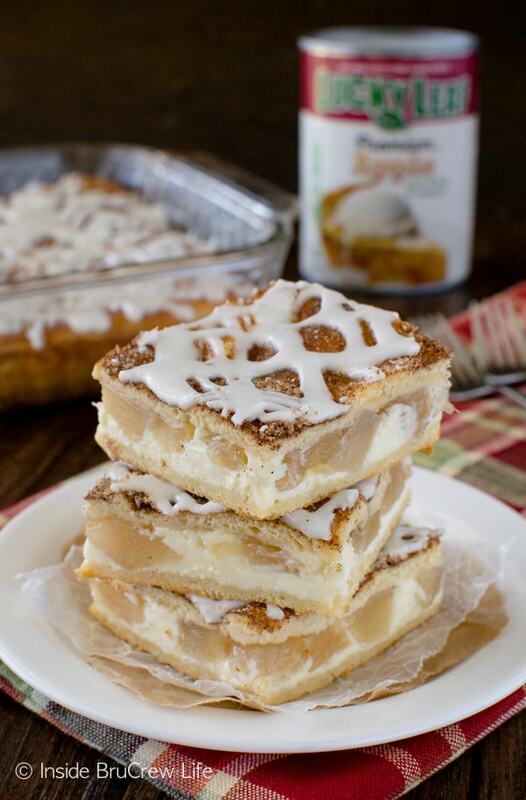 Make a pan of this Cinnamon Sugar Apple Cheesecake Danish the night before because you will want to enjoy a slice with your cup of coffee in the morning. It would be the perfect start to any day! 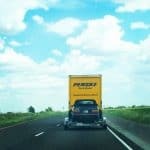 The other day I had an aha moment. Now this wasn’t your typical happy jump around and dance moment. I was looking in the mirror when it happened. I saw this shimmer on the top of my head. At first, I thought it was a strand of hair that had gotten an extra dose of highlighting. I moved in closer for a better look, and I realized that was not a blonde strand. That was most definitely a gray hair! Where in the world did that come from? Well, according to my youngest it is because his father and I are ancient and old as dirt. The sad thing is that as I looked closer, I found a few more gray hairs. That’s when the aha happened. I may feel healthy and in the best shape of my life, but that doesn’t stop the old from showing up. It’s true, I am officially old! I am choosing to be happy and look at life in a positive way even with those gray hairs popping out. There are so many things in my life that I have to be thankful for. We have a nice home with plenty of food to eat each day. My husband loves me and our three kids so much, and I know he would do anything for us. I love that he supports this blogging job that I do. Sometimes new recipe ideas come from him when I am stumped! Speaking of jobs, I am so blessed to have a job that I love and that I can do from the comfort of my home. The past four years I have gotten to go so many places, work with so many brands, and meet some pretty awesome friends. The best part is the flexibility to work when I want to and how much I want to. That flexibility has been great as I have been able to be there for our kids when they get home from school. When they were younger, it also allowed me to go on field trips with them. I am so thankful for three healthy kids that are growing up to be some pretty amazing young people. I do miss them being little, but this stage in parenting is kind of fun. They say and do some pretty funny things some days. Oh, don’t get me wrong this stage comes with challenging days as well. But overall, we are enjoying our time with them. Another thing that I am thankful for are the brands that make this work-at-home job possible. I have worked with over the past few years is Lucky Leaf®, and I am thankful to be partnering with them again to create recipes using their pie filling. Their cans of pie filling are packed to the brim with plenty of fruit goodness. You will not find any high fructose syrup in these cans. That makes me feel better as I’m spooning the filling into my mouth. Don’t judge. You know you do it too! This month I am all about the apple. 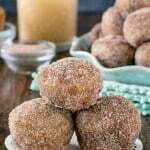 Once I made these cinnamon sugar apple donut holes, it unleashed the apple baking in our kitchen. 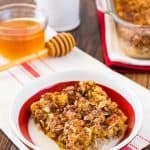 I knew that I wanted to create a recipe using the apple pie filling in my cupboard because my love for all things apples is strong right now. 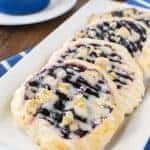 A cheesecake danish and a cup of hot coffee make a great breakfast every once in a while, so I gave this blackberry lime cheesecake danish a fun fall twist. 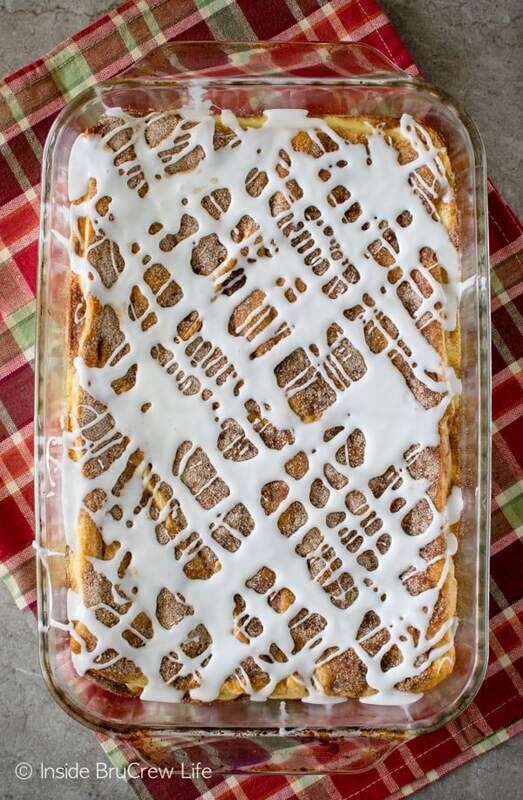 I layered crescent rolls, cheesecake, and apple pie filling in a pan to create a delicious large danish. 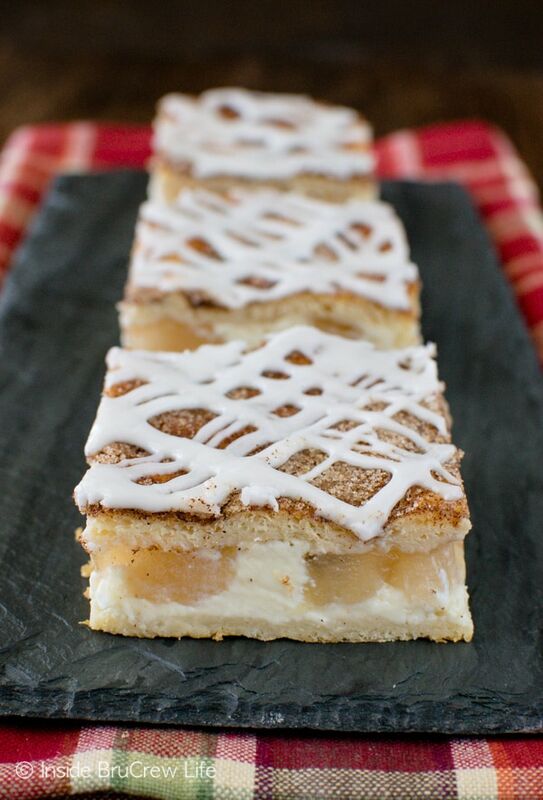 The cinnamon sugar coating on top gives it a nice crunch and flavor. Don’t forget the glaze! It adds such a pretty look to the finished danish! Set out your cream cheese out at least an hour before you want to start baking. If you forget, go ahead and unwrap it and microwave it for 20-30 seconds. Spray your pan with nonstick spray because you do not want your danish to stick to the pan. Make the cheesecake layer first. Beat the cream cheese until creamy, and then add the sugar. The sugar helps to continue getting your cream cheese creamy. Open the can of pie filling and pour it into a large bowl. 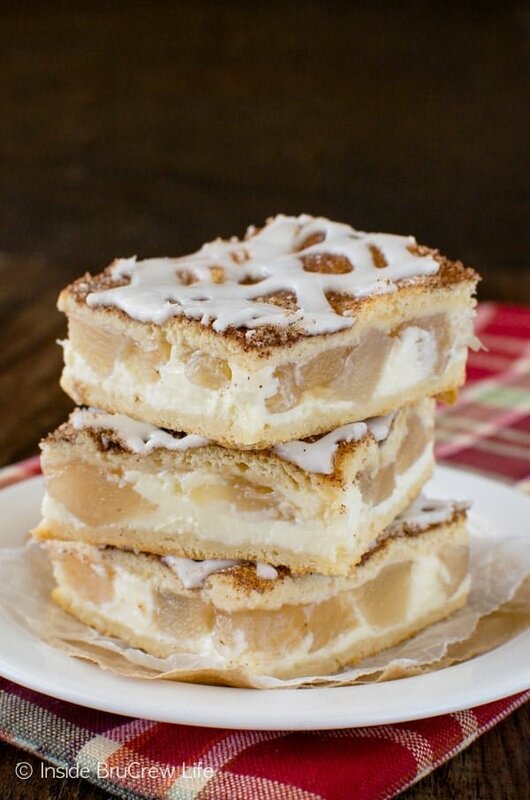 Use a knife to cut the apple slices into small bite sized pieces. Open one can of crescent rolls and spread it in the bottom of the baking dish. Spread out your cheesecake mixture and top it with the apple chunks. Place the second can of crescent rolls on top and sprinkle it with cinnamon sugar! Bake and cool. Drizzle with a glaze and then devour!!! 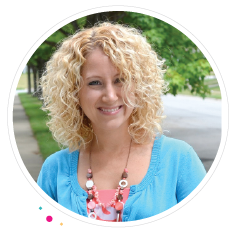 Last but definitely not least, I am thankful for all of my blog readers that come each day to read about our day to day life and to make our recipes! It’s because of your support that I am able to keep coming up with new ideas for you to try in your kitchen. Thank you so much!!! 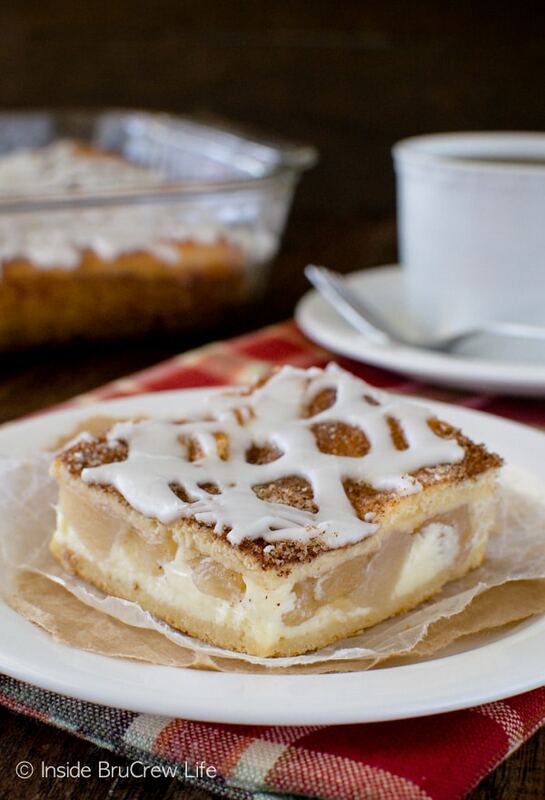 Creamy cheesecake and apple pie filling make this Cinnamon Sugar Apple Cheesecake Danish a great start to any day. Beat the cream cheese and 1/4 cup sugar until creamy. Add the egg and beat again. Open one can of crescent rolls and press the sheet of dough evenly into the bottom of the prepared pan. Spread the cheesecake filling on top of the dough. Open the can of pie filling and cut the apples into small chunks. Spoon the apples over the top of the cheesecake filling. Open the remaining can of rolls and place the sheet of dough on the top of the mixture. Gently squeeze or press together any seams. Stir together the cinnamon and 2 Tablespoons sugar. Sprinkle on top of the dough. Bake for 25 minutes. Remove and let cool one hour on a cooling rack. Refrigerate until chilled all the way. Stir together the powdered sugar and milk. Drizzle over the top of the chilled danish. Let set. Cut into 24 squares. Oh my goodness gracious! These look AWESOME! Oh it’s o.k. with your color hair you will hardly see it and I’m sure that it won’t impair your baking skills in any way….BTW I am dying to try these! Loving these bars! 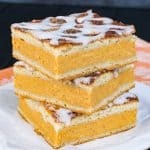 Perfect fall treat! Do not even get me started on the gray hair situation! Instead I’ll drown my sorrows in these gorgeous bars!! 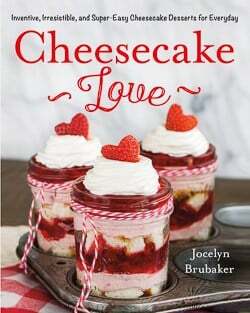 You had me at “cheesecake”! These look fantastic! I’d love to have a piece of this danish with my morning coffee! OMG! These look absolutely perfect! 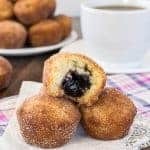 These are brilliant, there are so many flavors and textures going on ~ I’ve got my hot cup of coffee ready!